With traditions of academic excellence dating back hundreds of years and world renowned institutions in every corner, it comes as no surprise that the UK has become one of the top destinations to study. 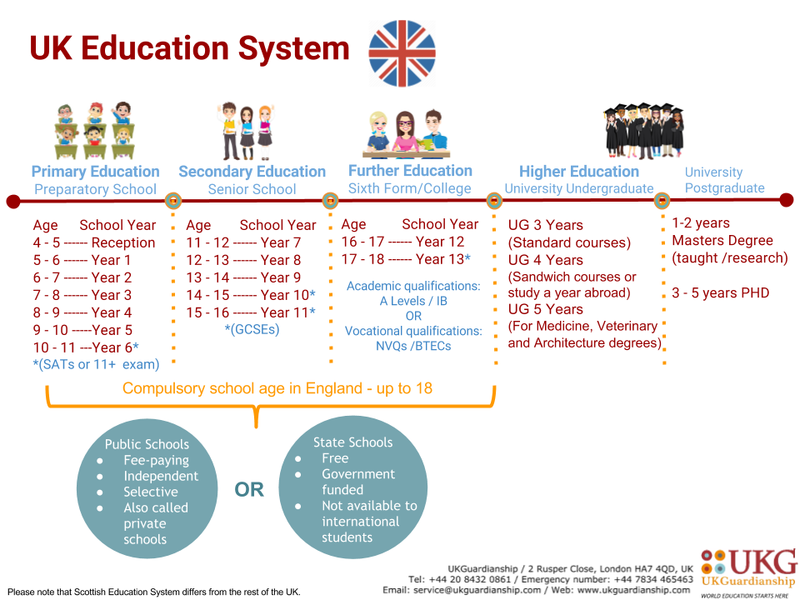 This article will explain key points related to the education system in the UK; however, please note that some practices differ in Scotland. The National Curriculum was established in 1988, provides a framework for education in England and Wales for students between the ages of 5 and 18. While the National Curriculum is followed by most state schools, some private schools and academies design their own curricula. Primary Education 1 1 5-6 Primary education begins at age 5 and continues until age 11. At the end of Key Stage 1 (year 2) and Key Stage 2 (year 6), pupils take compulsory SATs (Standard Assessment Tests). Secondary Education 3 7 11-12 During Year 9, students choose which subjects to study at Key Stage 4. These will be the subjects they take for their GCSE (General Certificate of Secondary Education) exams at the end of year 11. Further Education 12 16-17 At the end of students’ secondary education, they can either pursue academic qualifications such as A-Levels or IB in order to go to university, or vocational qualifications such as NVQs and BTECs to prepare them for full time employment. Higher Education University 17+ To find out more details about applying to universities in the UK, please visit University Application. In England, the compulsory education age has been extended to 18. Students must stay in full-time education, start an apprenticeship or traineeship, or start a part-time education/training course with 20 hours a week working or volunteering. A typical school year starts in September/October and ends in June/July. It consists of three terms: Autumn Term (September to December), Spring Term (January to April) and Summer Term (April to July). As well as having a week long holiday in the middle of each term (half term holiday), students also have longer breaks between terms: winter holidays (2-3 weeks), Easter holidays (2-3 weeks) and summer holidays (around 6 weeks). State schools are government-funded and provide free education to pupils in the UK. There are various types of state schools, such as local authority controlled maintained schools, academies with their own curriculum, selective grammar schools and religion focused faith schools. Tier 4 Student Visa holders are not entitled to free education in the UK, their choice of schools in the UK is limited to public schools (also known as fee-paying independent schools). Many people confuse public schools with state schools due to their name, but they are in fact in the private sector, where pupils do not have to follow the National Curriculum. UK private schools have a long history of academic excellence. Eton College and Harrow College are prime examples of UK’s high class educational institutions. However, with around 2,500 private schools throughout the UK, finding the perfect school can be a daunting task. To find out more about how to choose a private school and their admission processes, please visit School Placement. UKG’s experienced team has successfully helped many students gain admission into reputable private schools all around the UK, allowing students to flourish and reach their potential. We have contacts in many schools around the UK and can help to speed up and track your application. Please contact us for more details. In England, parents are expected to be involved in every stage of the education of their children. Schools regularly send information letters and newsletters to parents, concerning school activities, such as school concerts, parents’ evenings, school visits and guest speakers. Parents are encouraged to take full participation in these activities. As many international students are not accompanied by their parents during their study time in the UK, the UK Visas and Immigration (UKVI) and most UK schools require that students whose families live overseas have a legal guardian living in the UK to act on their behalf during term time and when the school is closed. It is therefore vital to find a responsible guardian to support children every step of the way. UKG has full AEGIS Accreditation and our team has many years of experience in educational guardianship in the UK, providing a 24/7 service that offers a high level of support to students, parents and schools. Our dedicated guardians will act on behalf of parents with problems in the school and attend parents’ evenings and meetings to discuss students’ academic progress with their teachers. Please contact us if you would like more information about our student guardianship services. ← A levels or IB – which is better for me?